Want to know how to turn your ideas into an animated cartoon series? Do you have a cool creative idea trapped in your head and you’re wondering how to turn your idea into something more? 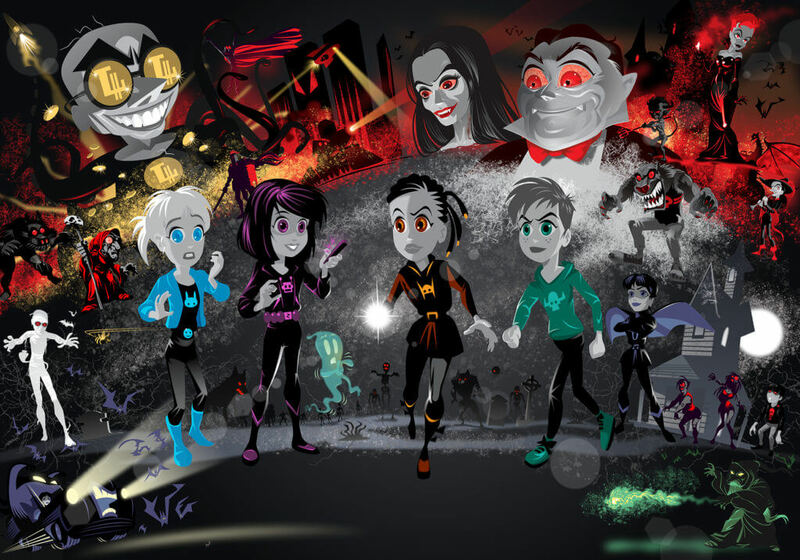 In this week’s interview, PK member, Peter Richardson, tells the story of how his new project, Spook Squad, went from a book, to a graphic novel and eventually into an animated show. There are many important lessons inside this story and we’ll break them down for you piece by piece so you can take that big idea you have and turn it into something bigger. The steps are easy once you know how. And, most importantly, you don’t need to be an amazing artist to get started…because the idea is where it all begins! “What I’d say to people with a great idea is to be prepared to take a few risks, be prepared to commit time, be prepared to learn new software, and be prepared to stick with your ideas.” ~ Peter Richardson. Your host, Mitch Bowler, introduces today’s guest, illustrator Peter Richardson, who talks about his 40-year career in the industry and how the idea for Spook Squad, his new project with writer, Roger Hurn, came about. In this chapter, you’ll hear how their project developed from an initial idea for a children’s book and graphic novel into an animated cartoon series. Along the way, Peter taught himself how to use animation software such as Moho (Anime Studio Pro), and developed his skills as a storyboard artist by studying the work of other artists he admired. How did Spook Squad Start to Gain Momentum? Creating a project is one thing, but what happens next? In this section, you’ll hear how Peter and Roger took their initial concept for Spook Squad to schools first, picking up an award from children’s literacy charity, The Book Trust, along the way. You’ll hear how feedback from the kids influenced their ideas, and how both men worked hard to eventually turn this project into a fully-fledged animation series through networking with other artists, agents and publishers. How did the Idea for Spook Squad Take Shape? The idea for Spook Squad began on a wet weekday afternoon, when writer Roger got feedback from a young girl in school who’d seen his book. After taking what she’d said on board, he starting thinking of ideas…and the project started to come to life. In this chapter, you’ll learn why having a good idea is the most important thing for a successful book or animation…and why you don’t have to be the world’s greatest artist to accomplish this. You’ll also hear how Peter and Roger have learned to handle rejection over the years, and why self-belief and supportive online communities such as Pencil Kings can help you through any difficult times. What Research did Peter and Roger do for Their Project? Spook Squad went through several changes before it eventually became an animated series. Peter and Roger found their initial idea for a book and graphic novel didn’t generate as much interest from publishers as they’d hoped, so a little more research was needed before they could decide which way to go next. In this section, you’ll hear how an online search for an artist led to Peter and Roger having a stall at Brand Licensing, a large trade show for creatives and the book industry, where they were able to start getting their project seen by the right people. So, how can you Turn Your Ideas into an Animated Cartoon Series? Through getting feedback from their target audience, learning from what other artists had done, and networking with the right people, Peter and Roger were finally able to get their Spook Squad project off the ground. But, how can you do the same? You’ll find out in this chapter. Where can you Find out More About Spook Squad? Want to find out more about Spook Squad? In this chapter, Peter lets you know exactly where to see his work and offers stacks of really useful advice from his long-running career as an illustrator in the creative industry. So, if you’re ready to turn your ideas into an animated cartoon series or start working on that graphic novel you’ve been dreaming about, here’s where you can get started. Mitch wraps up today’s interview with Peter Richardson and offers his own advice on how you can start turning your creative ideas into reality. We hope this week’s interview with Peter Richardson has helped you learn more about how to turn your ideas into an animated cartoon series. Got a big idea of your own? Let us know about it in the comments box below!